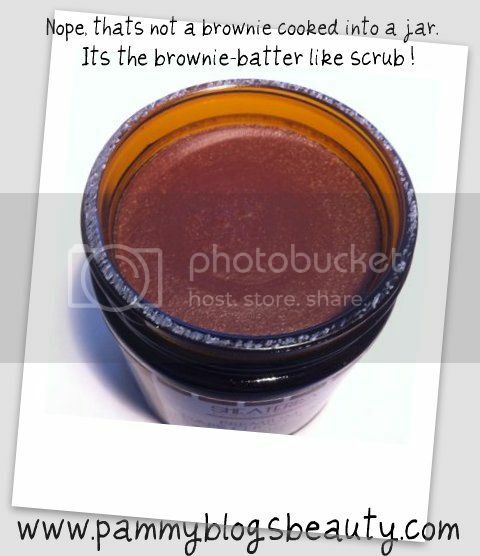 Now I realize that "scrubbing yourself down with a brownie" might not sound good to everyone. But, I am someone who loves food-scented products...so that sounds just like heaven! A Spa-Treatment in my own shower with a Chocolate smell. This product "had me at hello"! Not only is this delightful scrub chocolate brownie scented, but also it literally looks and feels just like brownie batter! YUM! Treat Your Skin with this Calorie-Free Indulgance: Shea Terra Organics new Premium Dark Chocolate Sugar-Stone Exfoliating Cream . This thick and rich scrub is such a decadant treat! It is so rich and chocolaty that you just feel indulgent when using it (but, lol, without the calorie-guilt!). We all know that chocolate is delicious. But, also, dark chocolate is host to powerful antioxidants. This 99.9 % natural scrub will soften and protect your skin wall also delivering these age-defying antioxidants directly into your skin. What else is in this product? Beneficial ingredients like organic shea butter, organic sugar, and volcanic stone...not to mention pure cacao and vanilla! Organic sugar compounds (glycolic acid) break down the dead skin with enymatic action to reveal softer skin. Organic volcanic stone works through microdermabrasion. The shea butter with then soften your skin. During my shower after cleansing, I just dip my fingers in the jar and scoop out a generous amount and then rub on my super dry parts like feet, ankles, elbows, etc. I apply by scrubbing lightly and then I rinse. The product rinses leaving you feeling and velvety soft moisturized. The product is super-duper thick..meaning you really have to dig your fingers in to release the product. But, it is so rich that you really only need a small amount. Shea Terra says that you can use this product every day. I find that I use it about twice a week. It is so quick to use and the richness and aroma of this product will make you feel like you are getting a spa treatment in your very own shower. I love that!!! I am all about the self-pampering. But, I rarely have the time. So, this scrub is just perfect! I don't use all over my body. I just use it on the parts that can handle some serious body microdermabrasion: elbows, knees, ect. While I have sensitive skin, I have not experienced any irritation from this product. As I have been writing this review, I keep sniffing this heavenly body scrub. Seriously! I can't stop smelling it, lol! Chocolate lovers like me, you will love this! I am looking forward to my evening shower just thinking of this decadant scrub! 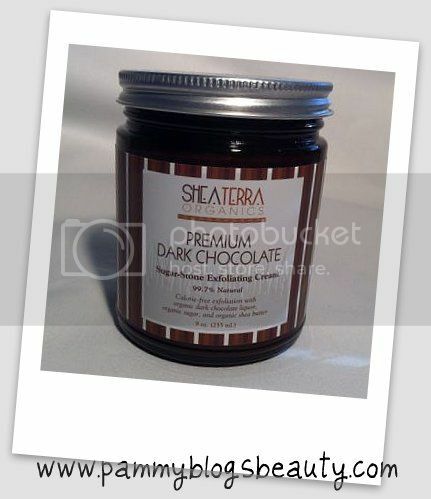 Hey, if I can't end my evening with a big delicious brownie, then I could always get my chocolate fix with Shea Terra Organics Dark Chocolate Exfoliating Cream! I am curious to scope out more products from this line! Shea Terra's body butters look amazing! Thanks for reading! :) Stay beautiful!!! I'd be too tempted to eat it! @Isis04-LOL, I know! :) Right!